Bear Ridge is the cutest little town that no one can remember. It gathers magic like faerie dust to a wand, especially at Christmas. Toni Bell hasn’t believed in magic since her parents died. She’s been on her own for more than a decade, driving from town to town, job to job, gig to gig, living out of her truck turned tiny home, making a point to never get attached. She’s on her way to the West Coast for New Year’s Eve, and plans to be on the road for Christmas, hoping to avoid the heartache being reminded of how alone she is brings. But a wrong turn, a loose dog, and a bollard pole change her world. Stuck in Bear Ridge until her truck can be fixed, Toni decides to make the best of it only to discover everything she’s ever wanted, and never dared to wish for, were all within her grasp. 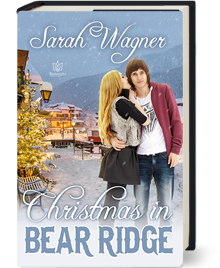 Nicodemus Panait makes her want to believe in magic, miracles, and Christmas, but she’s afraid that all he offers will prove too good to be true. Nico knows what his forever looks like, but he has only until Christmas to make Toni see it too. Fortunately, he has fate and love on his side.